Today was an exciting day for MAW Moscow. The morning began with a presentation by Tom Halabi, EBT Microsoft. He kicked off the day with a presentation on how to benefit from MAW in the weeks to come. These benefits include: guest blogging, Startup of the Day feature, Mobile Advertising consulting, and BizSpark program opportunities. Sergey Eremin, LSE Project Manager for Microsoft Russia, then spoke on the support MAW participants will receive locally. He talked about programs for startups in Russia and globally such as the Microsoft Startup Accelerator and BizSpark. Sergey also discussed the BizSpark One program, selection criteria, and benefits for startups. A prominent example is News360, a MAW alumnus and BizSpark One member, which has accelerated their development and marketing success through the programs. MAW participants were then surprised by a special guest. Gaidar Magdanurov, director of Microsoft Seed Fund in Russia, took the stage to share some interesting insights about the fund and application process. After a quick break for lunch, the startups got right back to work, finishing development and preparing for Media Day. During this time, Microsoft offered 1:1 business consultating sessions to each of the startups. Later in the afternoon, key members of the Russian press and blogging community came in to talk 1:1 with the startups. The entrepreneurs had a chance to demo their mobile apps and the work they have been doing throughout the week. Ten companies took the stage and presented in front of a panel of judges. 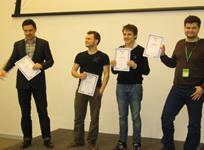 Each jury member was given a fictional $1,000 to ‘invest’ in the presenting startups. Press members were particularly impressed with the demos and rapid progress the companies had made in only four days. ClipClock! ClipClock received a publication space in RIA-News, one of the most popular business media outlets in Russia. The second place prize went to NormaSugar with Speaktoit and Kwikpik tying for third place. The second and third place finishers will have the opportunity to publish on www.ms4press.ru, a “Microsoft for Media” website. Congrats to all the startups on a great week and outstanding pitches. A special thanks goes to all speakers and jury members. The presentations left everyone eagerly awaiting the publication of the apps on Windows Phone! The day concluded with a special dinner celebration. The dinner gave the participants time to relax and enjoy each other’s company after a long week’s work. There was also time to do some networking over a delicious Russian meal. Check back tomorrow for an update on the final day of MAW Moscow or stay tuned to Twitter for updates throughout the day. You can also find more general information about MAW on the homepage and application information here.